Thunderbolt 2 made its debut when Apple released the latest version of its MacBook Pro last October, but it’s become more prominent with the relase of the new Mac Pro. How different is Thunderbolt 2 from its predecessor? Here’s what you need to know. 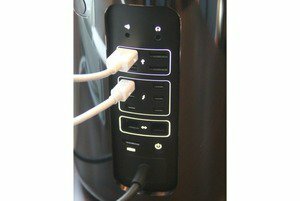 On the back of the Mac Pro are six Thunderbolt 2 ports, four USB 3.0 ports, independent Gigabit-ethernet ports, an HDMI-video port, and audio jacks. Thunderbolt is an interconnect technology developed by Intel in cooperation with Apple. Thunderbolt combines PCI Express and DisplayPort into a single connection, allowing for a combination of up to six peripherals, like storage devices and monitors, to be daisy-chained together. You can also connect USB and FireWire peripherals via Thunderbolt, as long as you have the proper adapter. Those connections won’t run any faster just because they’re on a Thunderbolt connection. We covered much of Thunderbolt’s background in our FAQ on Thunderbolt. If you’re interested in taking a deeper dive into Thunderbolt at an introductory level, you should read that FAQ. I’m focusing on Thunderbolt 2 here. Thunderbolt 2 is an update to the original Thunderbolt specification and takes the original’s two 10 Gbps bi-directional channels and combines them into a single 20 Gbps bi-directional channel. The amount of data able to go through a Thunderbolt connection hasn’t increased, but the throughput of a single channel has been doubled. What does Thunderbolt 2 have to do with 4K video? 4K video (a video format that has four times the resolution as 1080p and is gaining popularity with video professionals) requires more bandwidth than the original Thunderbolt can accommodate. Thunderbolt 2 will be able to stream that 4K video and write it to disk at the same time. How many peripherals does Thunderbolt 2 support? Thunderbolt 2 will still support up to six peripherals and will continue to support USB and FireWire via adapters. Can you connect Mini DisplayPort displays to Thunderbolt 2? Thunderbolt 2 does work with displays that use Mini DisplayPort. Thunderbolt 2 also supports the latest DisplayPort 2.1 specification, but not the daisy-chaining capabilities included in the spec. And remember that 4K video format we just talked about? DisplayPort 1.2 adds support for that ultra high resolution format. Will drives using the original Thunderbolt work with Thunderbolt 2? Yes. Thunderbolt 2 uses the same connectors as the original Thunderbolt, so Thunderbolt 2 devices will be backwards compatible with Thunderbolt peripherals and vice versa. But a Thunderbolt device connected to a Thunderbolt 2 port will perform at the Thunderbolt speed of 10 Gbps. Do older Thunderbolt devices on a Thunderbolt 2 daisy chain affect performance? Yes. If you have a mix of generations on a Thunderbolt 2 daisy chain, make sure that the Thunderbolt devices sit after the Thunderbolt 2 devices on the chain. Anything placed after a first generation Thunderbolt device will operate at Thunderbolt speeds. My Mac has Thunderbolt. Can I upgrade it to Thunderbolt 2? Unfortunately no. A new Thunderbolt 2 controller would need to be soldered down on the system’s motherboard. That’s why there was never a Thunderbolt upgrade offered for the current Mac Pro. How does Thunderbolt 2 compare to USB 3.1? Thunderbolt has a maximum throughput of 10 Gbps. Thunderbolt 2 has max throughput of 20 Gbps. SuperSpeed USB 3.0 has a maximum throughput of 5 Gbps, which makes Thunderbolt 2 up to four times as fast as USB 3.0. Recently, the USB Promoters Association announced the USB 3.1 spec, which allows USB to transfer up to 10 Gbps. USB 3.1 is still a while away from shipping, though. 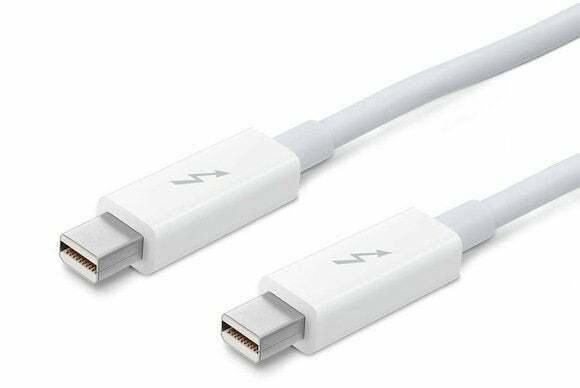 Also, while USB hubs are common, USB devices (like printers and hard drives) don’t generally have USB output ports to enable daisy chaining, which is a key feature of Thunderbolt. Which Macs have Thunderbolt 2? The only Mac systems that currently include Thunderbolt 2 are the brand new Mac Pro, and the latest generation of Retina MacBook Pros. Thunderbolt 2 will probably make its way into the iMac, MacBook Air and Mac mini when Apple updates them. Note: article updated to correct DisplayPort 1.2 information.